I served 2 years as the Secretary of the DVOC. As of Jan 11, I am now the Vice President of the club. My duties have changed from taking the meeting minutes to scheduling the programs for the meetings. 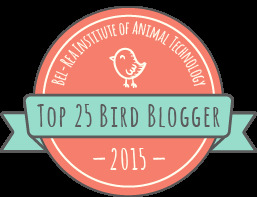 The thought of finding speakers for 18 presentations per year is overwhelming. While I love birding and know alot of other birders, I really don't know that many ornithologists. I panicked and started contacting people back in June as possible speakers. What a relief. I have 2018 fully booked. The 2018 programs started with a tour of the Academy of Natural Sciences Ornithology Department and Specimen Tour presented by Dr. Jason Weckstein. 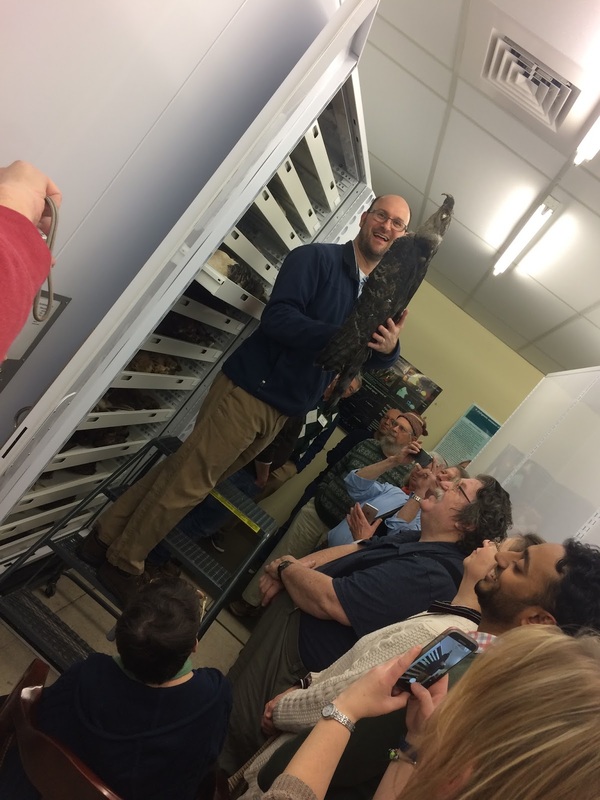 Jason is a member of the club and full time associate professor at Drexel University (which now owns the museum) and associate curator of the bird collection. The meeting drew double the attendance as normal with over 40 people. Jason gave a short presentation and then he and his colleagues took us all up to the 4th floor to tour the specimen collection. We started with Harpie Eagle which is one of the largest and most sought after eagles in the world. This is Jason holding one up for the members to see. 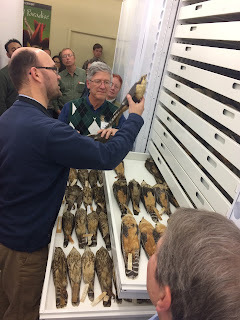 Here he is showing us Aplomado Falcon specimen. The 4th floor is full of cabinets like the one shown here. They are on tracks and can be moved to create aisles. 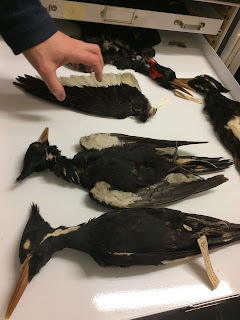 The highlight for many members was seeing extinct species skins. 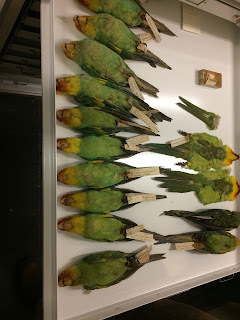 These are Carolina Parakeets which were once very common along the mid-Atlantic region. They went extinct years ago as settlers cleared the land and removed their habitat. Incredible to think of our area having parakeets. 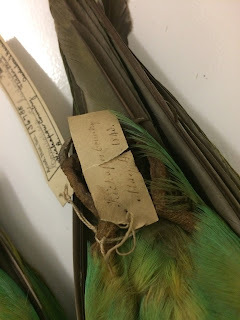 Jason pointed out that one of the parakeets was tagged by John James Audubon. Here is a photo showing his handwriting. Incredible to think that these birds were collected in the early 1800's and are still in good condition in the museum's collection. Imperial Woodpeckers are, rather were huge birds found in the tropics. They remind us of Pileated Woodpeckers on steroids. 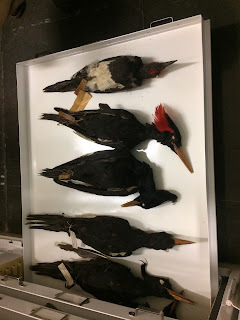 Their close cousin is the Ivory-billed Woodpecker. This is a species that has made the news in recent years. It was written off as extinct after 1946 however there are always reports from the deep bayous of Arkansas and Florida from someone who says that they heard or saw one. 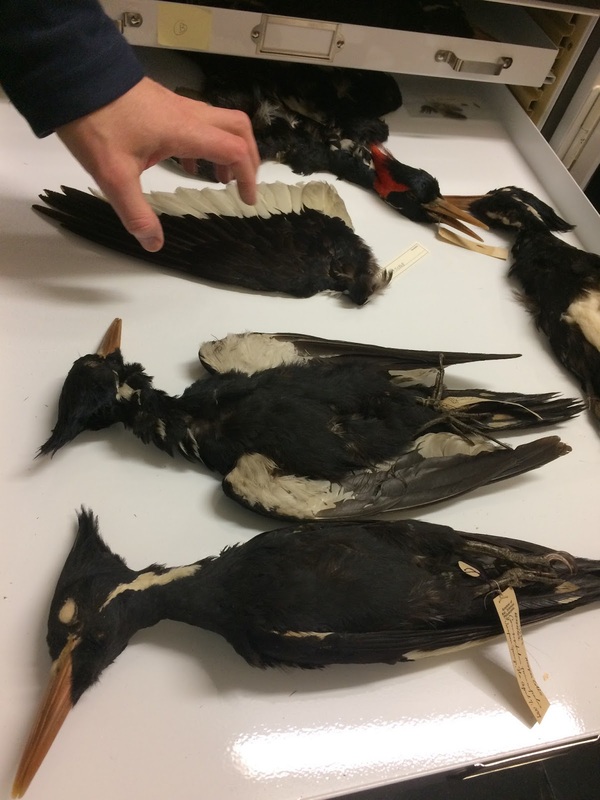 These stories have ornithologists launching massive searches resulting in even more questions about whether the species is still in existence. After a recent search, ornithologists asked the Academy if they could examine a wing from a specimen to compare to a very blurry video. Here is Jason showing us the famous wing. Do Ivory-bills exist? Probably not but wouldn't it be great if they did. Anyway, the tour was a big hit. Here is hoping that the rest of the programs go off without a hitch.